I'm an artist from Iceland. I studied in Italy, at the Academy of Fine Arts in Florence and graduated in 1998. I live and work as an artist in Italy. I get my inspiration from far and wide, from my dreams and inner sights. I'm attracted to the unknown, spiritual matters and some kind of surrealism. But the Icelandic light, the colours and mountains have influenced me a lot in my work. In my painting I like to place normal things in some kind of strange circumstances. The spectator has the freedom to interpret the work for himself, find his own story and experience his own fairytale, his own path. You can't live in Florence, the cradle of the Renaissance, without being affected and influenced by all the beautiful masterpieces that surround you everywhere you go, and there is probably some inspiration from that period in my works as well, as well as in the technique I use in my paintings. For the last two years, I have focused a lot on flowers in my imagery. I love flowers, the colours, forms, softness, joy, fragrance and structure, and the stories they can tell us. 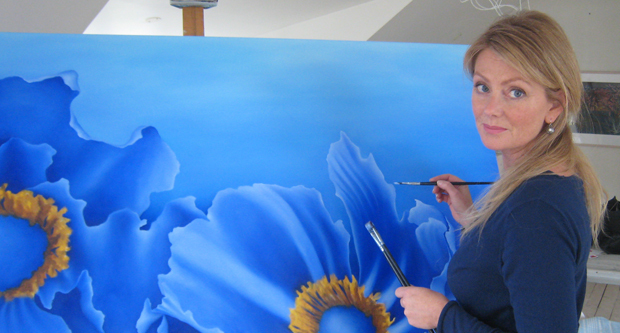 In some of my flower paintings I invite spectators to stop for a while, step inside, and experience the narrative it suggests to them in their own way. My imagery reflects my own mental world and something I find in my heart.